Inglewood United kept their title fight alive with a 2-0 upset of rival contenders Perth SC in Round 21 of the PlayStation 4 National Premier Leagues WA at Dorrien Gardens on Saturday. Goals to Ash Rosindale and Callum O’Connell were enough to decide a tense encounter where both sides had everything at stake. A win for Perth would have seen them secure the title with a week to spare, while Inglewood came in looking to wrestle back top spot and push the overall race all the way to the finish line. Inglewood’s Taki Nicolaidis, who previously led Perth to second place on the league standings in both 2014 and 2015, said he was amazed by the character of his playing group. “We as coaching staff put bits and pieces together but ultimately, at the end of the day, the character of that group is amazing,” he said. “We’ve won a game and we’re back on top but we’ve won nothing yet. We’ll celebrate the win as we do every game but as of tomorrow it is full focus and planning from a coaching point of view. Both teams came out of the blocks early, showing no complacency at either end. Gustavo Catarcione, who is currently the competition’s top scorer, showed a touch of individual class that nearly gave Perth the lead after five minutes. After getting on the end of an attempted clearance from Alex Dunn, who had come off his line, Catarcione executed a bicycle kick from distance that went narrowly wide and drew gasps from the sizable home crowd. Inglewood began to control proceedings and created a number of half chances before finding their opener on the half hour mark. A sublime through ball by Jason Barrera saw Ash Rosindale cut in behind Perth’s defence and go in on goal, and he made no mistake slotting past Francis Soale with the slightest of touches. Rosindale was through on goal again minutes later but his shot missed the target. Inglewood held their lead until half time but Perth came out in the second period looking to sway the momentum back in their favour. Alex Dunn was lucky not to be sent off in the 64th minute when he collided with Catarcione, who was in on goal, just outside the penalty area. From the resulting set piece Catarcione stepped over the ball for skipper Clark Keltie to unleash a powerful shot but Inglewood’s defensive wall stood strong to deny him. In the 70th minute Aleksander Jovic fired home emphatically for Perth, but his celebrations were short-lived as the assistant had his flag raised. Kenny Keogh came out the wrong end of a heavy fifty-fifty challenge with fifteen minutes to go, and the subsequent stoppage in play rather fortuitously put an end to Perth’s attacking momentum. O’Connell fired home from close range in the 82nd minute following a goalmouth scramble and despite Perth appealing for offside, the goal stood and the result was sealed. Perth coach Ramon Falzon said his side were not good enough on the day. “We missed a big opportunity, it’ll be a good learning experience for the youngsters but at the same time these opportunities don’t come around very frequently,” he said. 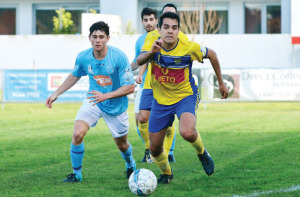 Perth could still grab the title with a win on the final day of the season against Sorrento but ultimately this will depend on other results. Inglewood have a tough fight of their own next week as they come up against ECU Joondalup, who haven’t been defeated since Round 10. Ash Rosindale said Inglewood’s coaching staff will work diligently on their game plan for the final day. 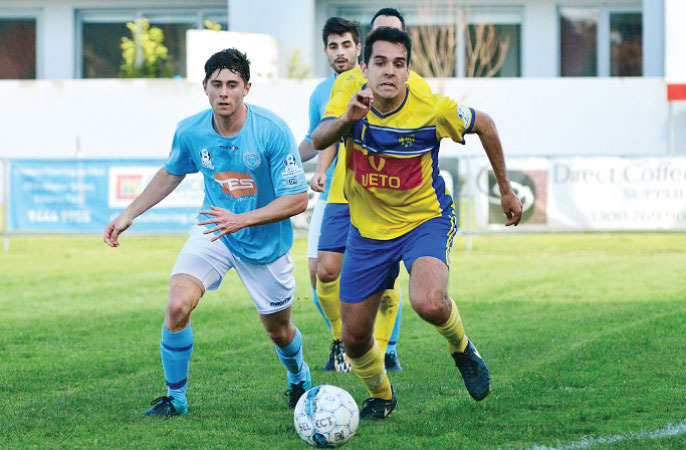 “ECU Joondalup are in great form at the moment, so I’m sure this week we’ll analyse the videos of them playing and come up with a game plan that we think will help to get us a result,” he said.